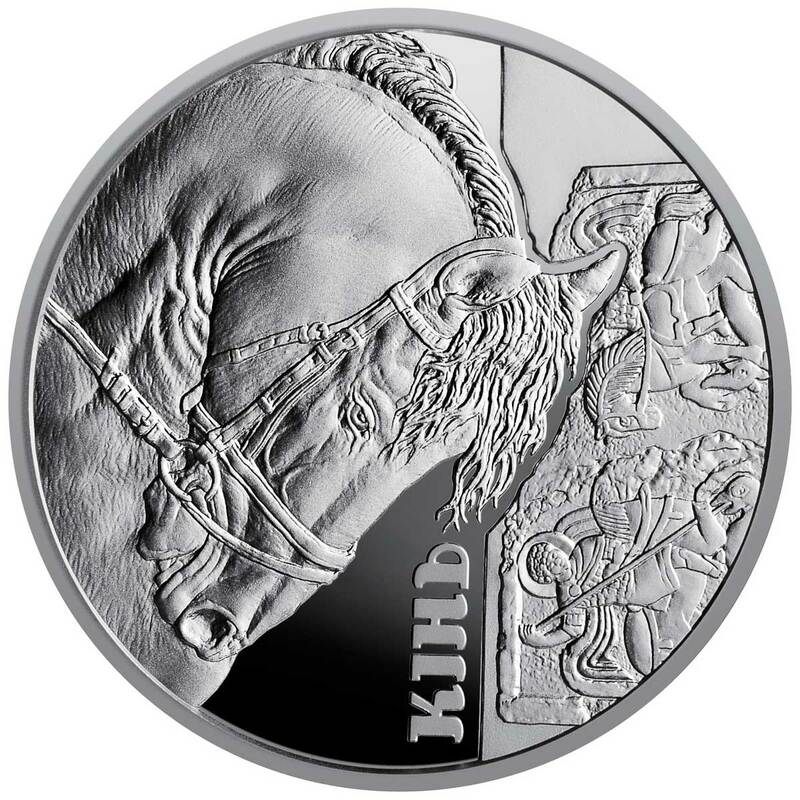 Another absolute favourite of ours, the National Bank of Ukraine’s stunning series of gilded silver coins celebrating their cultural artifacts, now has two new members. Snappily titled ‘Fauna in Cultural Monuments of Ukraine’, this series spotlights the use of animal imagery in art history, not just over the last few centuries, but going back as far as six millennia ago. 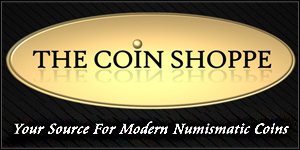 It’s a wonderful idea for a coin subject and the mints realisation of it is first class. Each issue chooses an animal that’s appeared on these artifacts. The part-gilded obverse shows a view of a specific piece of art (the gilded part is a close-up of the animal from it), while the clean-struck reverse shows a different piece in the background, with a realistic depiction of the featured animal taking pride of place. The two 2019 coins are the 9th and 10th to date, and there are likely going to be at least two more in 2020. This time around it’s the turn of the Ram and the Horse. Both are, as usual, quite beautifully done, but the horse issue is probably our favourite to date. The former features an artifact around two millennia old and the latter dates back to the 11th century. 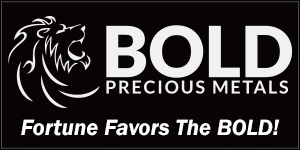 As before, these are ½oz sterling silver coins with a mintage of 4,000 each. Available now. 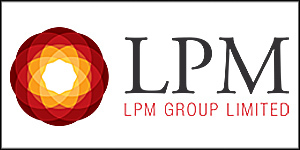 We have a Coin Series Profile to the range up which you can read HERE. 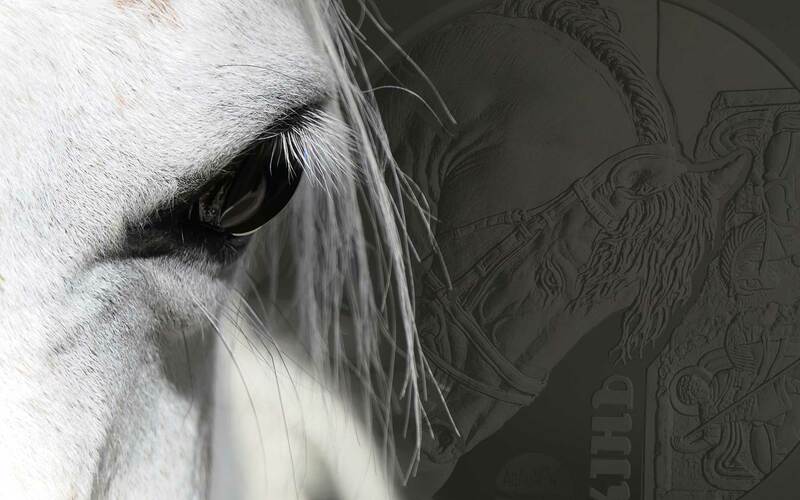 The horse is dedicated to the image of the cultural monuments of Kievan Rus – one of the brilliant pages of the history of our nation’s culture, which is an integral part of the world cultural heritage. In the territory of modern Ukraine, for thousands of years, tribes and peoples who created a distinctive culture, inheriting the next generation, lived. Beliefs and religions demonstrated a respectful attitude of people towards nature, in particular to animals. 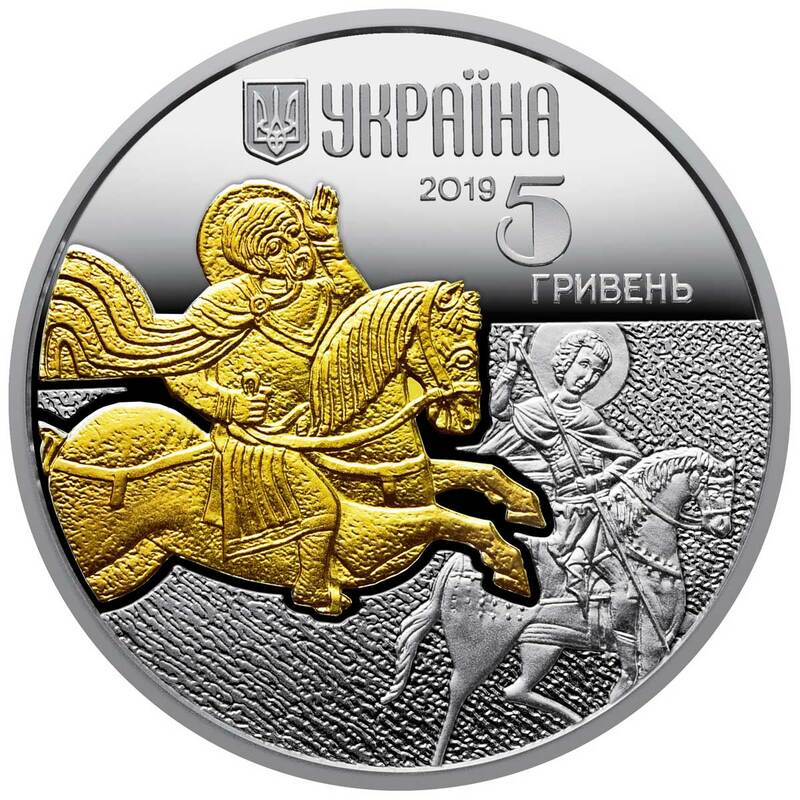 OBVERSE: The small State Emblem of Ukraine, the inscription UKRAINE, under which is the year of issue of the coin 2019 and the face value 5 / ГРИВЕНЬ; in the center there is a gilded image of a fragment of Kyiv stone relief of the XI century. depicting the holy martyr Eustache Plakids on the background (to the right) of the image of St. George the Victorious from the icon of the second half of the XV century. 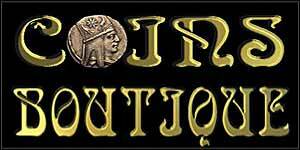 REVERSE: There is a horse’s head on the left, to the right of which on the mirror background is a vertical inscription KIN (below) and a fragment of a slate plate of the XI century. depicting the holy riders who trample a snake. Dedicated to the ram, the image of which is embodied in the cultural monuments of different eras, created thanks to the talent and work of many thousands of nameless masters. During the centuries of modern Ukraine, the tribes and peoples who created the culture, inheriting it for subsequent generations and providing continuous progressive development, lived. Beliefs and religions demonstrated a respectful attitude of people towards nature, in particular to animals. 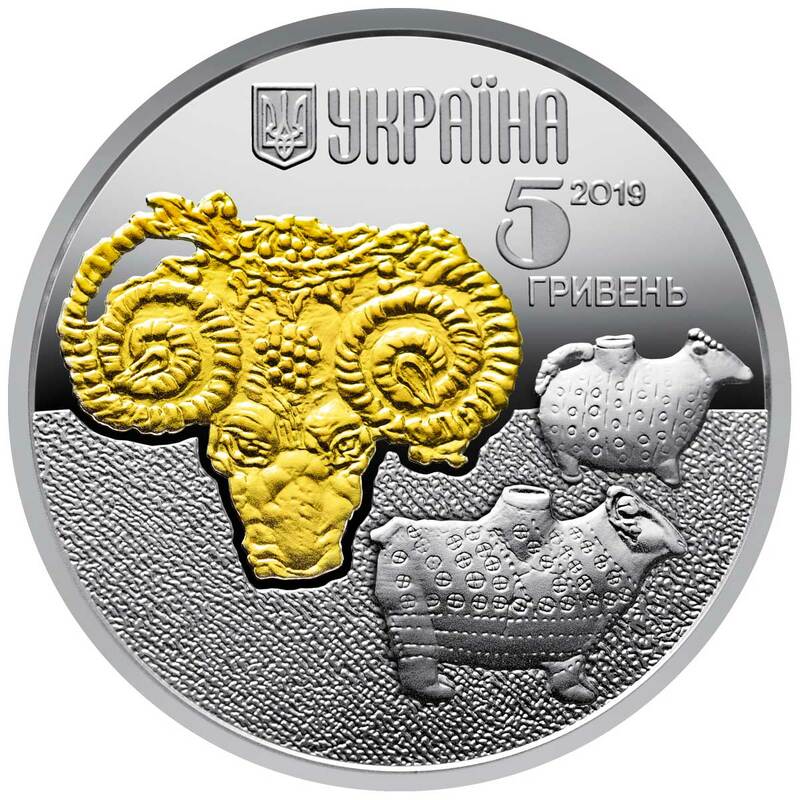 OBVERSE: The upper small State Emblem of Ukraine, to the right of which is the inscription UKRAINE, under it the face value 5 / ГРИВЕНЬ and the year of issue of the coin 2019; in the center there is a gilded image of a metal relief depicting the head of a ram (Northern Black Sea Coast), to the right of which are the monuments of Sarmatian archeological culture: two ceramic vessels in the form of rams from the cemetery of Neizats, which is in the Crimea. 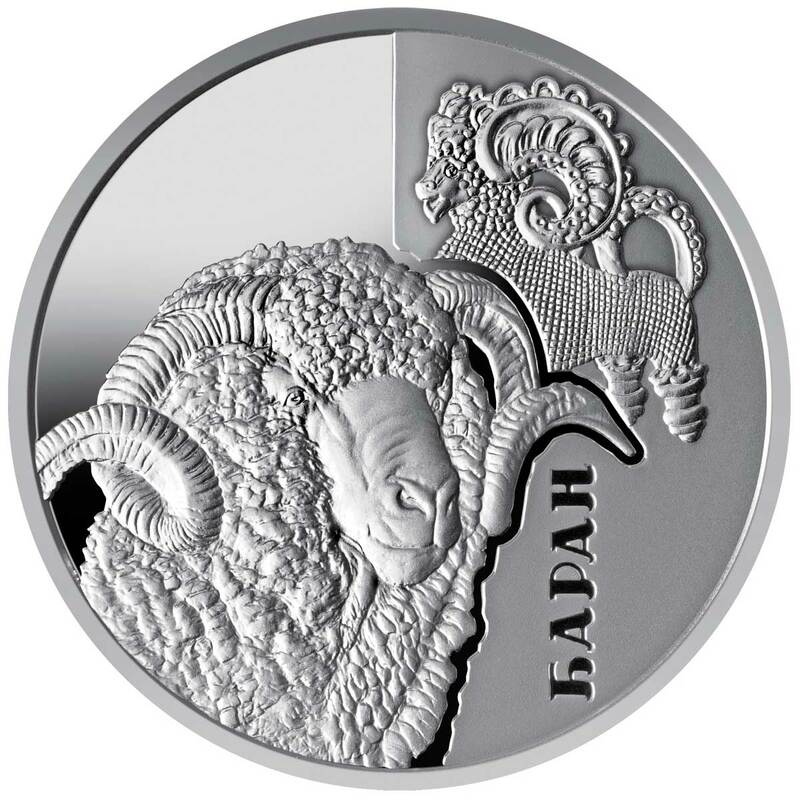 REVERSE: On the reverse of the coin on the left, on the mirror background, the head of the ram is depicted, on the right of which a vertical inscription BARAN (below) and a picture of the opshnya ceramic sheep (Poltava region) are placed on a matte background. Mik,Where can you buy these? They’re hard to find.